Thanks for this; I too read a lot by and about Plath years ago. The Ariel poems are stunning. Indeed they are. She didn’t get many of them published during her lifetime, as they were considered too different. She was warned about Hughes before she married him, but she chose not to listen. She believed she could tame him. They did enjoy a fruitful creative partnership for a while, but the marriage was turbulent from start to finish. I don’t know if its about being able to have it all whether you are male or female. I think it is whether you’re able to contain the personality that goes with so much talent and make good decisions. As always great piece. Thank you for commenting! Plath and Hughes were both outsized personalities, so the union between them was bound to be explosive. Interesting piece about an intereating woman. Thank you! My fascination with Sylvia Plath began in college (quite some years ago) and has continued ever since. Fascinating read. I’ve always wanted to learn more about her, so this is great! Thank you! I’m waiting eagerly for the second volume to come out later this year. Really interesting read. 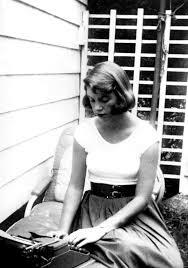 I learned things about Plath that I had not known and that changed the way I remembered her from my early college days at UMass-Amherst back in the mid-1970s. Thanks so much! Thanks! By the way, Plath used to spend occasional weekends at Amherst, dating various guys, when she was a student at Smith.